The seventh edition of Dhaka Lit Fest, an international literature festival, ended yesterday with a call to stand beside the oppressed people irrespective of their nationalities, colors, languages, creeds and cultures.Finance Minister Abul Maal Abdul Muhith was present at the closing ceremony in the afternoon followed by the DSC Prize Award Ceremony of the DSC Prize for South Asian Literature 2017. The poets, novelists and writers who gathered at the Dhaka Lit Fest 2017 from different countries were not an exception as they illustrated intrepidly the biggest humanitarian crisis of the present time, created from the endless trail of Rohingyas, fleeing from persecution in their homeland Myanmar. The Let Fest, an annual august gathering of national and international luminaries, this year saw a separate session on Rohingya crisis besides the usual schedules for the festival. Writers, artists, poets, novelists, researchers, analysts and journalists participated in the session titled "Rohingya: Humanity in Despair", held on the second day of the festival, began on Thursday. Participants at the session on Rohingya described the Rohingya crisis as the most barbaric incident in human history and called international communities for putting mounting pressure on the Myanmar government to end the crisis. At the session, Indian writer Tapodhir Bhattacharjee referred to the comments of different organizations and countries saying that the persecution of Rohingyas had already been seen as genocide. Many writers talked elaborately about the history of the Rohingya, showing concrete evidences of their citizenships in Rakhine state of Myanmar. Apart from the session, some eminent writers and poets expressed their concern at the Rohingya issue, calling Myanmar authorities to bring an end to the crisis as soon as possible. "Of course, we are against all kinds of deprivation and repression. We have to work together to mobilize global opinions on the Rohingya issue", Sophia Walker, a British poet, told BSS. She hoped that the Dhaka Lit Fest would help create more awareness among writers across the globe on the Rohingya issue so this humanitarian crisis can be solved soon. Eminent novelist Imdadaul Haque Milon said Dhaka Lit Fest gave an opportunity of highlighting the plight of Rohingya people before the world through discussing the issue with both foreign and local authors. 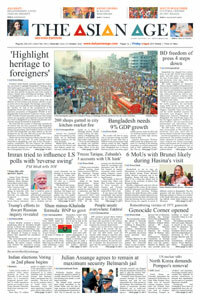 "Historically, poets, writers and people in cultural sector play an important role in inspiring and encouraging people to launch movement and bold stance against all sorts of repression, violence and other forms of deprivation", Annisul Hoque, one of the Bangladesh's celebrity fiction writers, said. The directors' note of DLF mentioned that the Dhaka Lit Fest would help draw the world's attention of the world community to put pressure on Myanmar. The seventh edition of DLF hosted over 200 speakers, performers, thinkers, representing 24 countries, making it the largest and the most diverse gathering so far. The three-day literary event, where people with different languages and cultures gathered with a common goal to foster literature practices, virtually turned into a platform for sharing and exchanging diversified literatures and cultures breaking the boundary of literary landscape, authors and book lovers viewed.